60th anniversary of our 1959 Minis. The Mini 60th celebrations start here at Mini Fair, Bingley Hall, Stafford, on the 27th January 2019. We shall have a 1959 Mini Register stand at this first show of the 60th anniversary year. A great indoor event to start the year off. If you would like to display your 1959 Mini on our stand at any of the events listed below please get in touch for details. Himley Hall, Dudley. – 12th May. Free passes available for 1959 Minis on our stand if pre-booked with us. British Motor Museum at Gaydon – 4th August. We intend having a 1959 Register stand at this event with as many 1959 Minis as possible. This is a chance of getting the biggest line-up of 1959 Minis we’ve ever had. We would like to get 60 cars to this main event of the year, so if your 1959 Mini doesn’t drive, put it on a trailer. We find the unrestored ones often attract the most attention. If you wish to arrive on the Saturday and camp overnight you will need to book your pitch with British Motor Museum (link below). There will be a Mini Mosaic world record attempt to get 600 Minis together on the Saturday. If you wish to participate your Sunday entry pass will also covers this. 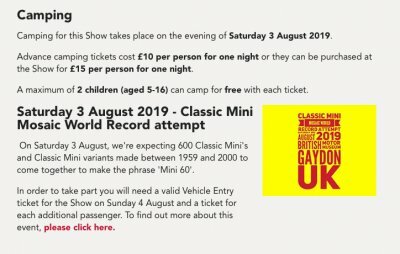 Tickets for camping can be purchased via the British Motor Museum here. 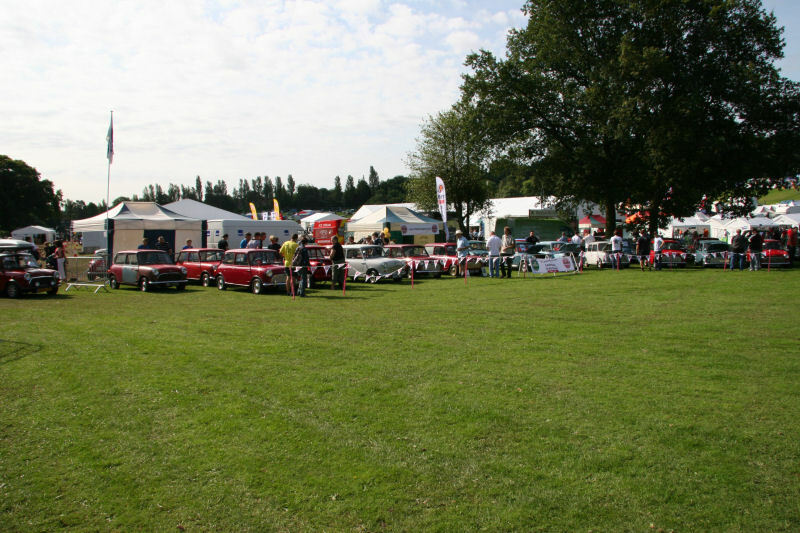 Free passes available for 1959 Minis on our stand on Sunday 4th August if pre-booked with us. IMM International Mini Meet. Bristol – 8th to 11th August. There will be a charge for entry to this event. See www.IMM2019.co.uk for details. Either a weekend pass or Sunday day pass will be required obtainable from the organisers. We have been unable to obtain concessionary passes for 1959 Minis at this event. We will only be having a dedicated 1959 stand on the Sunday if there is enough interest. Stanford Hall, Lutterworth – 15th September. Free passes available for1959 Minis on our stand if pre-booked with us. Castle Combe, Chippenham. – 28th September. 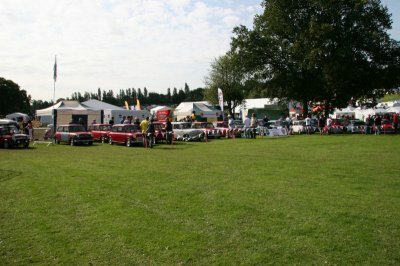 We would love to hear from any of you who are interested in joining us at any of these events with your 1959 Mini. Make contact with us here..